Quite a few people are understandably dismayed that Jace the Mind Sculptor was banned or dismayed that he was allowed to be printed with bannable abilities. I just hope no-one's thinking of taking it out on the new card, because the fact is, Jace still has plenty to offer as the Memory Adept. Yeah, he costs more than what certain writers call the "sweet spot" for planeswalkers (Gideon says hi, by the way), but unless your opponent has an Elixir of Immortality effect handy, there's no equivalent to damage prevention for milling. Most blue cards that can win the game in this cost range are Sphinxes and Djinns, many of which are amazing but much easier to potentially recover from. Granted he doesn't defend himself like Garruk or Chandra, but you're blue, right? You have access to Wall of Air and Wall of Frost, right? The other thing is, there's very little chance he'll get banned the way Worldwake Jace did. Welcome back readers today’s card of the day is Jace Memory Adept the new heir to the most powerful planeswalker throne…or not. Jace Memory Adept in standard is in my opinion mediocre, mill has never been powerful in standard except for a few rare instances and a planeswalker dedicated to milling seems bad. However his +1 ability is pure card advantage and as long as the opponent is not basing his or her deck around graveyard the mill won’t matter much. The glimpse the unthinkable ability seems powerful on paper but will be less powerful in practice especially on a five mana planeswalker. The final ability can be good to end a game but will rarely come in handy. With Innistrad and the possibility of a graveyard based block this card may see a high increase in play but for now in the world of standard, extended, and eternal formats it may see moderate play but it is not insane and nowhere near as powerful as previous versions of Jace. In casual and multiplayer this card will see loads of play, milling Is a popular strategy for decks and this is a solid card for players interested in those sort of play, the glimpse ability pointed at a single player is not the best use of milling but the ultimate more than makes up for it. In limited milling is a serious strategy and although it requires two blue mana this is a first pick like most planeswalkers. Overall a decent card not quite up to snuff with the previous forms of Jace but powerful In his own right. 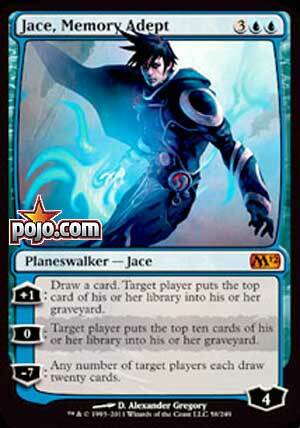 Today's card of the day is Jace, Memory Adept which is a five mana planeswalker with four loyalty. The plus has you draw a card and target player puts the top card of the library into the graveyard which can be used on an opponent to mill or on yourself if you know the top card will not be useful. The second ability has no cost and mills ten cards from target player's library which is will make a bit of a dent, but requires dedicated support to function well. Both deck destruction and some kind of Proliferation to increase counters on Jace to bring out the third ability which at minus seven has any number of target players draw twenty cards. This can be used on yourself to draw into anything you want, which is risky as it may get towards the bottom of your library, or as a big part of either deck destruction or to trigger draws card effects. Unlike many mill strategies this actually can work in Multiplayer and this Jace certainly has potential, even if the first ability is the bulk of the usage. Overall it should see play and may bring back the archetype to a playable level as the set also includes Jace's Archivist and Jace's Erasure. In Limited there may not be much support available, but the format works to your advantage with forty card decks. Jace can easily win the game with either the second ability if he is protected by creatures or other effects and should always be used in Sealed unless you have an incredibly poor Blue pool. An absolute first pick in Booster and should not be passed outside of extreme circumstances as just surviving three turns is all this Jace needs. Welcome to another great card of the day review here at Pojo.com. Today we take a look at Jace, Memory Adept from M12. Jace, Memory Adept costs five mana, three generic and two blue mana. He enters play with four loyalty counters, and is back to having just three abilities. The first one says add one counter, draw a card, target player puts the top card of his/her library into his/her graveyard. The second ability is a zero ability that says target player puts the top ten cards of their library into their graveyard. The final ability is a minus seven loyalty counters, and says any number of target players draws twenty (20) cards! With the banning of Jace the Mind Sculpter, Wizards went out of the frying pan and directly into the fire. This guy literally makes Jace the Mind Sculpter look like nothing more than a Cathartic Adept! A zero ability, yet again, that does ridiculous things! Milling away ten cards while not affecting the planeswalker is just insane! Let alone how well he combos with his spells from this set. Draw 20 cards off of his final, which would subsequently mill someone for 20 cards if you have a single Jace’s Erasure out, then use Jace’s Achivist, which would force each player to discard their hands and then draw cards equal to the highest number discarded this way. It almost ensures a completed mill in a few short turns, so long as you can protect him. Zendikar has some of the best cheap, decent blockers to do so. The planeswalkers they ran in M12 are just crazy. The set is so crazy overpowered it will shake the foundation of Magic, and alter the landscape of professional play drastically, which is what Wizards wants. However, it is quite evident that while they drastically altered it, they also did so in a manner that will allow Jace to remain a permanent fixture in the top contender decks, and give rise to several mill decks in the top spaces. I would like to add I hold nothing personal against Jace or blue, I just wish the balance of power would be greater divided between the colors when it comes to creating new planeswalkers and spells.